Have cooking books gone full circle with ordinary everyday people writing them? To qualify that, by ordinary I mean as opposed to the famous celebrity chefs. 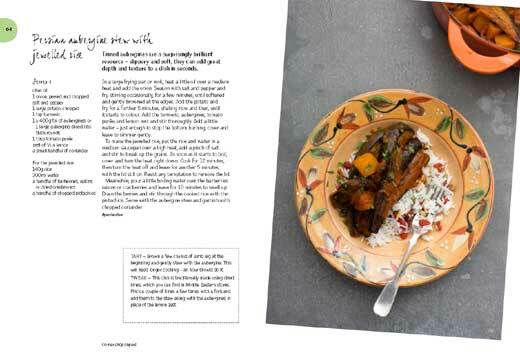 Of course, you are not ordinary if you are capable of writing your own cooking book to such a standard that a publisher wants to take the risk of publishing it. Quite the contrary, you need to have a gift and that gift is to be able to communicate on a level where we all feel we are sharing something with the writer, the writer is not talking down to us and most importantly the writer gets us wanting to cook. And who is James Ramsden? No big TV show to make him famous overnight. In his Blog he describes himself as a London-based Yorkshireman. He runs the Secret Larder supper club and has written about food and cookery for The Times, The Guardian, Sainsbury's Magazine, and lovefood.com, among others . That about sums it up. I am not sure what came first but in May 2010 James was selected by The Times as one of the 40 bloggers everyone is talking about. He was also hailed as one of the best new food writers by Rose Prince in the Daily Telegraph. There have been so many awesome books, with awesome recipes, published by celebrity chefs that the very word awesome applied to cooking or food makes us cringe! This is just a very nice book, with very nice recipes written in a very different style which makes you want to read the book. It is the most entertaining read she has had for some time from a cookbook. Partly because there are some great new recipes in there that are out of the ordinary and that she had not comes across before, but also because he shares tips and thoughts in a most anmusing style. This is not your dry-as-dust recipe book from 1940. 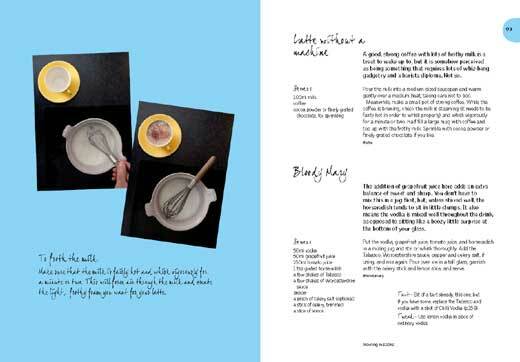 This cook book is excellently laid out - printed on white paper using clear, readable print, with, except in a few cases, a recipe per page. It's quite informally written, but not in an irritating Jamie Oliver kind of way (sorry Jamie, I do like you really, but find you a little irksome at times!). His instructions are easy to follow and the methods very simple. I love his Tarts and Tweaks, little ideas for making the dish different or more special, or substituting one hard-to-get ingredient for a more easily accessible one. There are beautiful full colour photographs of the finished dishes, or an ingredient, or a particular method. 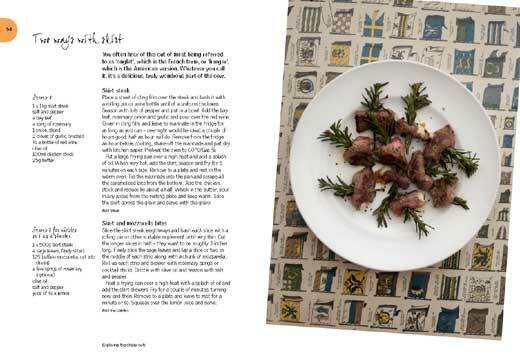 James has written a few introductory paragraphs at the start of each section, and a brief paragraph under each recipe heading giving an amusing introduction to every dish. 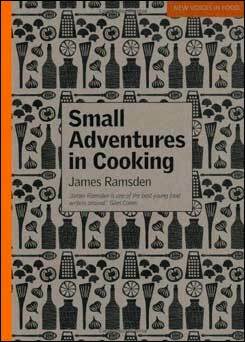 James Ramsden's Small Adventures in Cooking is one of those cook books which is instantly inspiring - the kind that makes you want to try out some of the recipies immediately. I have to admit to reading cookery books as some might read the latest thriller, sometimes I don't try the recipes instead savouring the descriptions instead. With this book I just had to try some out. If you are looking for some new ideas, easily done so it doesn't frighten the horses, then this is a good way to branch out without making huge expensive purchases. Consider this stress free adventure cooking! I do like the introductions, very personable, I tried the 5-minute sponge after reading about where he found the recipe. Adding little nuggets of information like that encourages the home cook to try things out. There is nothing here that will concern the reader, no lengthy list of odd ingredients, no weird ingredients as such - you will find everything in your local food shop/supermarket. The author writes with an interest and a passion about food that is very contagious. The outlay of the book is retro, very now but I would imagine will be a welcome accompaniment to any cookery book collection. However handsome books do not necessarily translate within the pages - here it does. Anyone who wants to adapt their basic cooking skills, impress friends over for dinner, find new favourites with unfamiliar ingredients will enjoy trying out these recipes. 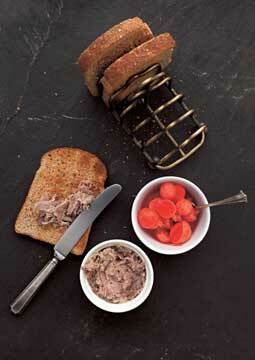 Rillettes is basically a rough pâté. The meat is cooked in a low oven, basting itself in its own fat, before being pulled apart, seasoned and set. Sprinkle a good handful of salt over a roasting tray and lay the duck legs on top. Put another handful of salt on top, cover with cling film and refrigerate overnight. Preheat the oven to 170°C/Gas 3. Scrape off and discard any excess salt from the duck. Place the legs in an ovenproof dish with the bay leaf and thyme leaves. Melt the duck or goose fat with the brandy and pour over the duck. Cover with foil and cook in the oven for 2 hours. Remove from the oven and leave to cool in the fat. When cool enough to handle, tug the meat from the bones with your hands, discarding the skin, bones and any gristle. With a pair of forks, pull the meat apart until it resembles a coarse pâté. Season with pepper and add enough of the fat to coat the meat well. Pat, but dont press, into individual ramekins and cover with a little of the remaining fat. Serve at room temperature with toast and cornichons, or pickled radishes. Tart  You can play around with the seasonings here, adding a teaspoon of allspice at the end, or some crushed juniper berries to the melted fat. Tweak  Follow the above recipe using chunks of pork belly instead of duck to make pork rillettes. Tomorrow  Any leftover rendered duck fat will keep for months covered in the fridge, and is perfect for roasting potatoes in. The story goes that in 1950 an Italian countess, who I imagine must have been fat as a barrel, waddled into Harrys Bar in Venice and declared that her doctor had told her that she could only eat raw meat. The chef produced very thin slices of raw beef with a little dressing, and the dish was named after the Venetian painter Vittore Carpaccio. Serving such an Italian dish with a very French salad like remoulade might therefore seem perverse, but food is about flavour, not diplomacy, and beef, celeriac and horseradish are natural bedfellows. Thinly slice the fillet. Taking a slice at a time, lay the meat under a sheet of cling film, bash with a rolling pin until paper-thin and lay on a plate. Repeat with the remaining slices, cover with cling film and refrigerate until needed, removing an hour before serving. Peel the celeriac and discard the peelings. Grate into a bowl and mix with the mayonnaise, lemon juice, horseradish and parsley. Season with salt and pepper to taste. When ready to serve, arrange the carpaccio on one large or six separate plates. 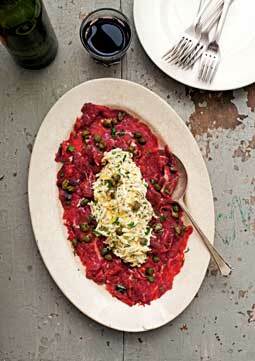 Pile the remoulade over the centre of the beef slices, scatter over the capers and drizzle with olive oil. Serve. Tart  Finely chop some hazelnuts and scatter with the capers. Tweak  Swap the horseradish for grainy mustard in the celeriac remoulade. Tomorrow  Any leftover remoulade is delicious on toast. Drop any preconceptions that I have completely lost the plot here and please have a go at this tart. It will knock your socks off, and your guests will think youre a total wizard.